In today’s class, we’ll be talking about game networking. For the purposes of this class, we’ll focus on local multiplayer games as our working example. I’ve created a Unity sample that demonstrates how to create an authoritative server setup in Unity (all game logic and object control done in a server, clients display their local version). We’ll do a small exercise with it in class. Over the course of the class so far, we’ve avoided using the Character Controller, for two reasons. It is worthwhile to understand how things work, at a slightly lower level, implementing the collisions and push-back code to keep your avatar out of geometry. In a 2D platformer, this is doable, especially when the geometry is simple. The built in controller is somewhat limiting and fixed in it’s structure. This can be a problem for certain games. However, as I work through building 3D sample for class, and think about P3, I’ve changed my mind on it’s for P3 and future assignments. Problems with the controller for platformer is that uses a capsule instead of a cube for the avatar (resulting in weird behaviors at the edge of platforms), and sliding along the edge of geometry (which, you can and should control with your own collision reaction code). But once we move into 3D, its likely your want to use that kind of collider, and with more complex geometry, you need the behaviors the controller provides. Here’s a discussion of the reasons in favor of Character Controllers, in NVidia’s PhysX SDK Documentation (since Unity is built on PhysX, it’s likely that this discussion applies directly to Unity). It create a pretty rough-looking infinite side scrolling platformer (in the genre started by Canabalt). What I like about it, though, is that it’s all code-based: there are no pre-built models or animations that get “dropped in”. There are some things about it that are old (it uses the old particle system, for example) because it was written a while ago. But, there are some nice programming and code-structure techniques demonstrated. If you are new to Unity and/or C#, I recommend it. It will only take an evening or two. Super Mario Crossover by exploding rabbit is a great study/illustration of game feel! The blog has a Unity + WordPress plugin, that we will use to post Unity web games for your project submissions, and group project builds. Click somewhere on the grey plane and watch as your hero dashes to save everybody. However, you can’t save them all. Georgia Tech has bought a subscription to Lynda.com, a website with hundreds of video courses covering a wide range of topics. There are a half dozen Unity3D videos, along with videos on 3D modeling and animation, that might be very useful to some of you. 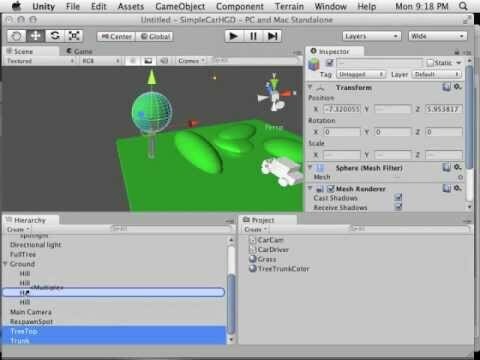 Chris DeLeon (your fellow student in the class) pointed me at a introductory Unity tutorial he created, that is on youtube. Chris is a Unity wiz, so I suggest you take a peek!